Game Three of the second-round matchup was set to start amidst a host of questions. Would Ian Mahinmi return after missing the entire first round? How would Avery Bradley and Markieff Morris play after working through respective injuries they played through with limited success in Game Two? Would both teams be at each other's throat again? Would officials call the game tighter because of it? Who will guard John Wall? CAN someone guard John Wall? Would the local media find yet another terrible, terrible thing Isaiah Thomas does wrong while kicking their team's posterior? I could go on and on with all the subplots swirling around this gem of a series, but instead, let's review how the game ended up answering those questions for us - most of them, anyway. The Celtics went 5:17 without scoring before that Isaiah Thomas free throw. The arena was strangely empty, yet again, seemingly with almost as many Celtics fans as Wiz fans. The game started with Washington winning the tip and Bradley Beal and Avery Bradley fittingly trading buckets. A trip to the foul line and a trey from Beal forced a quick time-out from Brad Stevens as he seemed hell-bent on making up for the tire fire of a game he offered up Tuesday. Avery Bradley came out of the timeout with a quick layup to keep the game close, but Otto Porter answered right back, only to see Jae Crowder do the same from three. The close play continued, with Marcin Gortat and Crowder scoring from the field and Wall from the line, but buckets from Morris and Porter started to give the Wiz a cushion at 12-18. Turnovers and a lack of offense from Boston added to the lead, with the Wizards building yet another 17 point lead with two left in the first. A Bojan Bogdanovic trey pushed the lead to 20, the biggest of the series for Washington. Thomas hit one of two free throws with about a minute left to break the run of over five minutes and 22 points. Despite Boston's best efforts, the quarter would end with the Wizards holding the massive lead for the third straight game, powered by a very balanced effort on their end, and a deer-in-headlights response from the Celts. The second started with some ruckus between Jonas Jerebko and Mahinmi resulting in double techs after they both fell on a Jerebko layup. Isaiah managed his first bucket at about 10:30 in the second, but Wall answered back immediately. Things seemed to settle down again until Kelly Oubre got pissed off at Kelly Olynyk on what he seemed to think was a intentional hard pick, who shoved him out of bounds. The act got him ejected AND gave Boston free throws, the first of which Olynyk short-armed. A Brandon Jennings floater and foul by Thomas seemed to waste the potentially momentum-shifting course of events. A Beal floater pushed the lead to 24 at the eight minute mark, and apart from a Horford trip to the charity stripe and a trey, Porter and the Wiz continued to lay it on. A Bradley trey with just under five left in the half broke the drought, and a Crowder steal and Horford three forced a timeout as the Celts got the lead back to 19. Thomas got fouled by Morris on a late in the clock trey, but missed his first two shots - nothing seemed to be going right for the Celts. A Smart trip to the free throw line only produced one make after a Gortat cut gave the Wiz another layup, a goaltend in favor of Wall, and a jumper by Jae left Boston down 23 at the half. Thomas was not on the floor for the second quarter for reasons not revealed at the time, but Crowder and the gang managed to hold off the Wizards during the stretch until he reappeared at 10:45 in the third. Turns out he needed emergency dental repair, which was quickly fixed in halftime. The Celts could not get closer than 20, missing shot after shot while the Wiz slowly built their lead back with free throws from Wall and Gortat and an and-one layup from Wall that pushed the lead to 47-73 with 8:00 left in the third. Thomas got Boston back on the board with a layup, but buckets from Gortat and Morris sprinkled with some first-rate flopping by Beal pushed the lead to 27. Boston kept Washington from field goals for the next several possessions, but the Wiz still managed to keep pace to an Al Horford three from the foul line. Horford and Wall traded another pair of buckets, but a Beal foul got Boston under the 30 point lead it found itself on the wrong end of, and an Otto Porter shove gave Boston the ball back. Yet another foul was called on the next play, on Gortat, and IT sank both. The Wizards started to look tired, yet somehow Wall managed to get another goaltend in his favor. A Horford trey chipped away at the lead, now 25, until Bogdanovic answered back with one of his own. Al Horford was Boston’s only halfway decent player tonight, and he’s -23. 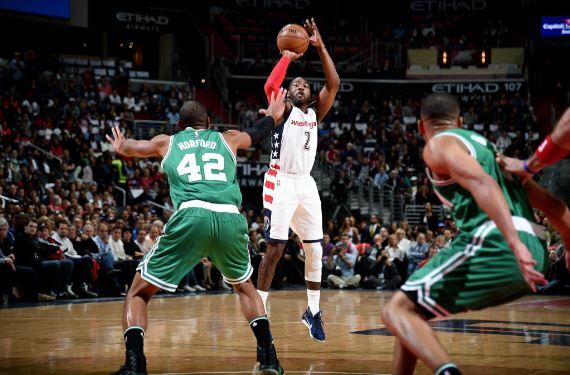 The teams traded buckets until Smart got fouled on a trey, sinking the and-one, giving Boston fans a shred of hope, but a Jaylen Brown foul on Wall handed the Wiz back two of the four points, the score 95-69 heading into the fourth. Smart managed to get fouled on the second play of that quarter, cutting the lead to 24 after sinking both free throws, only to commit his EIGHTH turnover just moments later. More chippiness between Terry Rozier and Jennings looked to add to the eve's rancor, with Rozier shoving Jennings for a common foul, then Jennings and Rozier earning double technicals on the next play, earning them matching ejections, and Stevens earning one of his own techs to boot. Down 28, it seemed Boston threw in the towel. James Young was subbed in to the game for Rozier, and Gerald Green and Porter traded makes before Amir Johnson scored his first basket of the game with 7:20 left in the game, only to nab an and-one bucket shortly after, closing the gap to 101-78 with seven left. Young hit a trey and Green got to the line on yet another tech, this one on Scott Brooks for good measure, got Boston to within 19 with six minutes left. Amir managed to foul Bogdanovic on a three-point attempt, who converted all three. Young then threw the ball away, and Jason Smith scored a floater several possessions after, answered by Brown on the next possession. Tyler Zeller getting fouled on a dunk attempt got the lead under 20 after converting one of his two attempts, but Sheldon McClellan (who?) hit a pair of treys and a reverse layup to rub it in, defeating the Celts 116-89. Boston next faces Washington at home this Sunday, May 7th at 6:30 P.M.